Reviews, Previews, and Beauty Related News by a self-confessed makeup junkie! I was actually checking out the other branch of Bath & Body Works for anything new or interesting (which I didn’t find) when Victoria’s Secret came into my direct line of vision (it was literally across from B&BW). So, I decided to pop in and check it out. It was kismet, because they were totally having a random store-wide sale! No mention of it on the Al-Shaya Privileges App or anywhere else (as per usual). Not quite sure why they don’t advertise these seemingly random store-wide sales because I for one would love to know beforehand (so I can prep save up). Fragrance Mists reduced from KD 7/500 to KD 3/500. 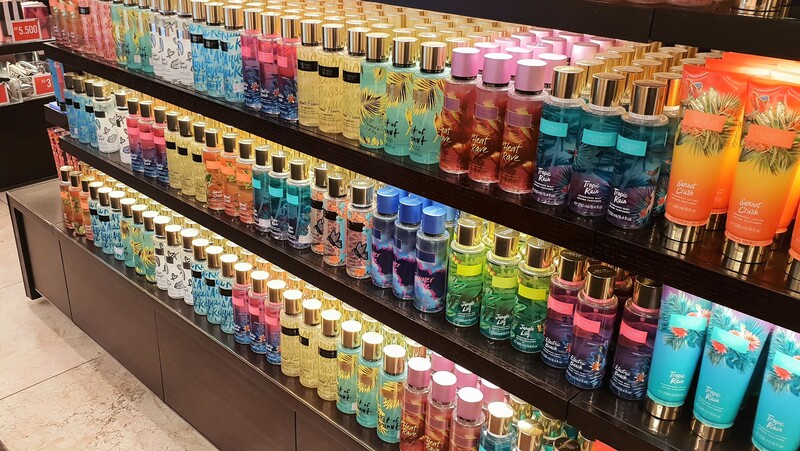 Fragrance Lotions were reduced from KD 7/000 to KD 3/500. A bunch of other stuff had been reduced as well! Honestly, it was a bit overwhelming (so. many. scents.) but also, so much fun (also because there were just so many scents to sniff and play around with including the ones from previous collections)! A lot of them had the notes listed on the back (which was super helpful)! The packaging on some of these was incredibly aesthetically appealing too (Electric Beach was totally giving me Miami Nights 1984 – Ocean Drive vibes)! I know the Fragrance Mists mostly consist of alcohol and therefore don’t actually last. However, I’m kinda’ obsessed with Fragrances now, so… whatevs. Naturally, I picked up a handful of stuff, but more on that in another post (haulage coming soon). Can’t find something you saw on LuLu ♥’s Makeup? Looking for something specific? Try searching for it by typing it in here. Enter your email address to subscribe to this blog and receive notifications of new posts by E-mail.